A company’s employees shape the success of the business. Their engagement in their work can mean the difference between profit and loss – the key factor for shareholders. Many factors contribute to the quality of a team (see four experts’ views in The Case on page 19 of Quality Quarterly) and leadership can have a big impact. But in such a high position also brings high levels of pressure and stress, which often results in CEOs having a short tenure at the top. What impact does that have on a business? According to research, the longer a CEO serves, the better the business performs. 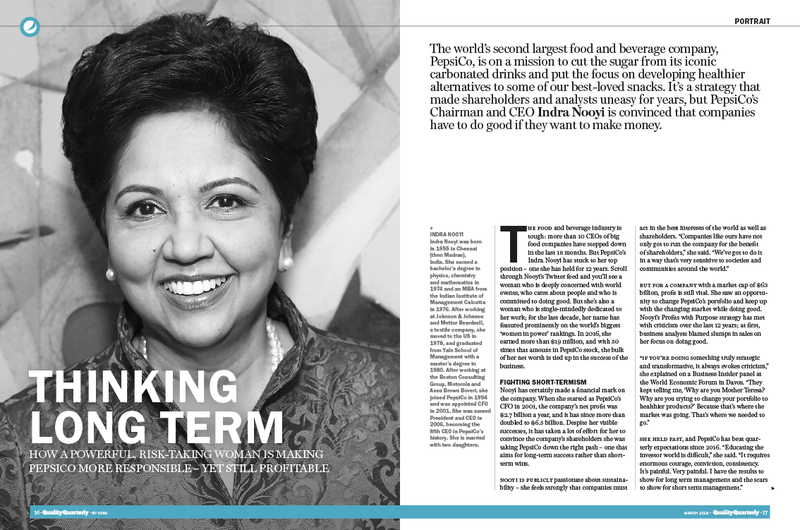 PepsiCo’s Indra Nooyi has been CEO for 12 years – right in the middle of the “ideal” range identified in a Fortune survey, which revealed a sweet spot between 10 and 15 years. They studied 100 large companies whose CEOs had left and found that short tenures – five years or less – resulted in an equal mix of positive and negative returns for shareholders. At about year seven, the positive began to overtake the negative, and 10-15 years was optimal. Similarly, an earlier study by consultancy Booz Allen Hamilton showed that CEOs in the position for over a decade had, on average, higher rates of return than those with shorter tenures. The average tenure of the CEOs of Standard & Poor's 500-stock index companies is currently 9.7 year – the highest average since 2002. A new wave of CEOs like Indra Nooyi, who has a focus on long-term results despite the pressure of short-term returns for shareholders, appears to be pushing the boundary. In late 2017 Jeff Immelt stepped down from the helm of General Electric after 16 years, far exceeding the average. But it’s not an easy ride. “The nature of a global CEO job like Immelt’s requires such a brutal schedule that it’s hard to imagine doing it for five years, much less 10 or 20,” reported the Washington Post. Indeed, there have been a number of resignations across the high-pressure food and beverage industry in the last 18 months, with more than 10 CEOs stepping down. And there is some evidence to suggest they made a good decision: while shareholders might be smiling, a long-serving CEO could be limiting the company’s outside sources of market and customer information. As the competition in the market continues to stiffen, and consumer pressure to consider sustainability issues mounts, we will likely see a greater divergence between the short and long-term pressures from stakeholders on a company’s CEO. Which will win the battle remains to be seen. Read QQ magazine as well! This online article is an addition to the above article in Quality Quarterly magazine of March 2018. Explore it here.